Next time you’re at the doctor’s office, DMV, bank, or store (or any other place where people are waiting), look around. Chances are, most of the people around you will be doing something on their phone. More than two-thirds of them (68%) are probably playing a game. In general, 77% of Americans turn to their smartphone to avoid being bored and 53% of them use it to kill time while they’re waiting in a line. And they definitely are waiting in line. Regardless of the fact that many stores, clinics, offices, and banks have concerted efforts in place to create shorter and more efficient customer journeys, Americans still spend an average 37 billion hours each year waiting for their turn. Innovative companies like Qmatic and Sticky Beat see this combination of inevitable wait times and consistent smartphone use as an opportunity. Gamification is the application of game design elements and ideas in non-traditional game contexts. By presenting information or tasks in a fun and active digital format, companies can raise the level of engagement, delight, and even productivity for their customers. Qmatic and Sticky Beat partnered to harness the necessary parts of queue management in a fun and useful mobile gaming app called Myfunwait®. Myfunwait solves the waiting equation for organizations by giving them a customizable tool for engaging with their customers in a meaningful way. Occupying the customer during his or her wait shortens the perceived wait time and creates an enjoyable customer experience. It accomplishes this task by putting engagement, entertainment, and even education directly in the hands of their customers, who likely are using their smartphone to find a way to make their wait seem shorter anyway. 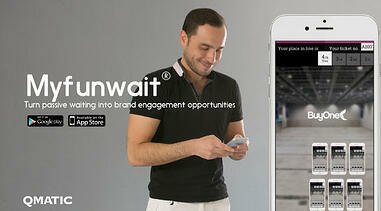 For businesses, the app represents one of the most innovative resources for improving brand perception. It taps into one of the most common customer behaviors to meet the customer where they are. It is an opportunity to deliver personalized updates about wait status in real-time. And it distracts people from the actual wait by entertaining them with custom branded games and quizzes tightly connected to the businesses’ brand. Myfunwait is integrated with the Qmatic Orchestra cloud platform so the mobile app ‘play’ serves to feed useful data into the customer journey process. Because it is designed for customization, each gamification interface can be tailored to be appropriate to the industry, brand, and audience. Qmatic has a fundamental belief that a wait time can be an opportunity to engage, entertain, and educate. And we have seen time and again that when an organization does those things it improves the quality of the relationship – and consequently, the brand loyalty and bottom line. What does fun look like to your customer? How can you turn that into an opportunity for your business? We can help you turn a queue line into a Myfunwait. Learn more about how Myfunwait can help your business. Sven-Olof Husmark is a customer experience industry pioneer and executive. For more than 20 years, he has directed the success of sales and marketing departments within international technology companies. 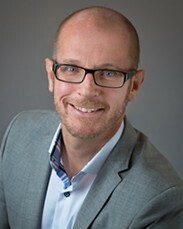 Since 2013, Sven-Olof has led the Qmatic team responsible for marketing products and services across the globe through partner channels, market intelligence, communications, and brand stewardship.